Another Christmas present finished!!! I just adore this one. 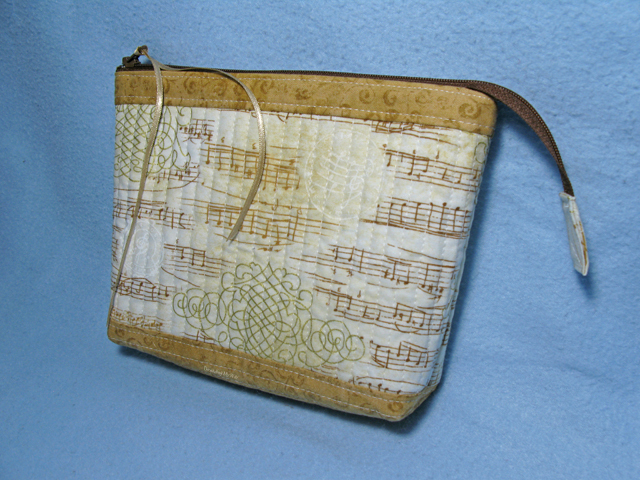 I'm not musically inclined in any way, but it's the combination of fabrics that make this little zippered pouch. 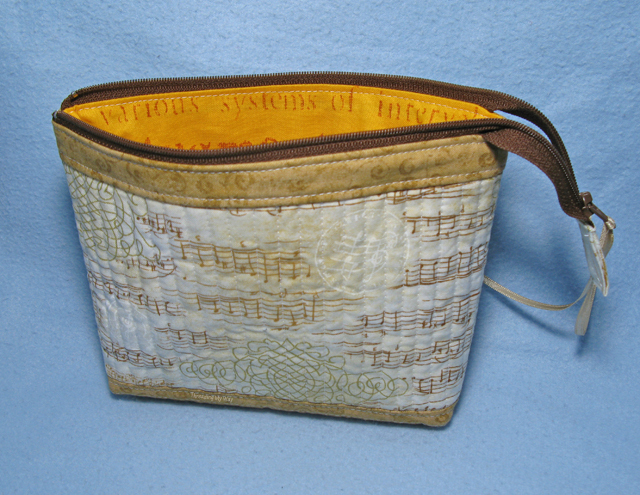 Unlike most of my zippered pouches, I didn't use fabric from my stash, as there's no music themed fabric in amongst the growing piles of offcuts in my sewing room. The lining first caught my eye, sitting on the sale items table outside my local quilt store. I picked up the sale fabric in a red colour way and then proceeded to try and match up other music themed fabric to the red sale fabric. Thankfully, one of the shop assistants came to my rescue. 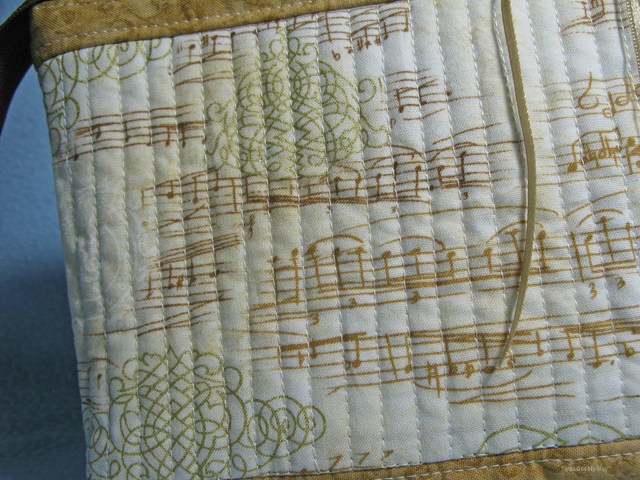 She swapped the red for the yellow lining, and matched the small floral to the music notes fabric. Never in a million years would I have hit on this fabric combination, whereas she managed to pull all three fabrics from different sections of the shop, in a matter of minutes. I can claim credit for the design, however. The construction is a variation of my Quilt As You Go fabric tutorial. 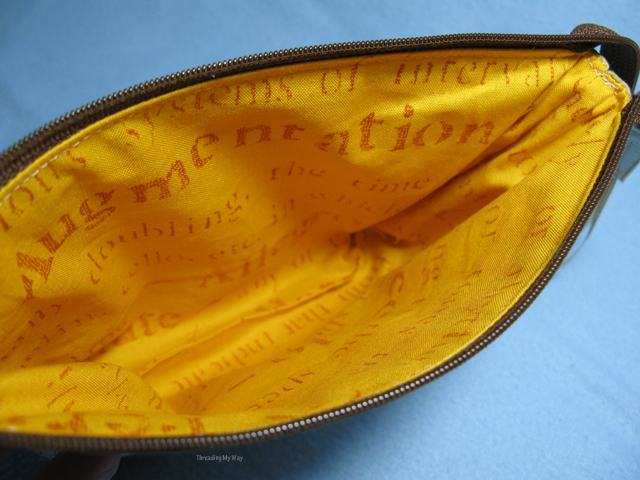 I've already made a bunch of QAYG zippered pouches this month, with my latest bringing the total to eight. As there was a deadline, I didn't have time to take photos of the process, but I have another cut out in the same design. Next time I'll take photos and write up a post with measurements, etc. 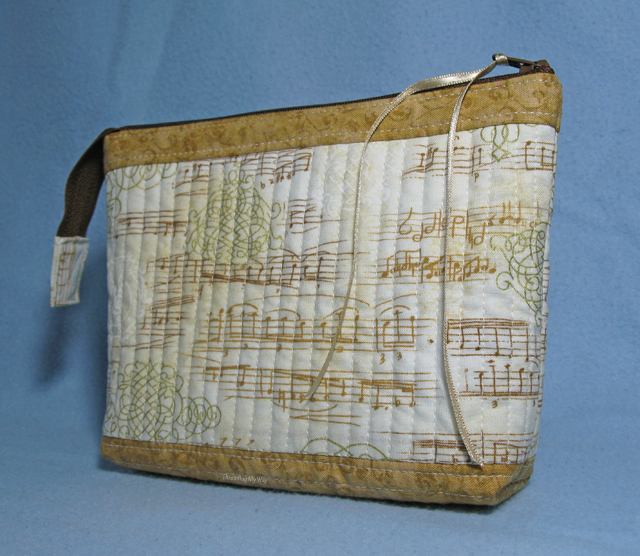 I don't have a clue as to the meaning of most of the musical terms on the lining fabric, but the recipient will. I only purchased a small amount of the main fabric; not enough to show the name on the selvedge. All I can tell you is that the floral is a Timeless Treasures line. 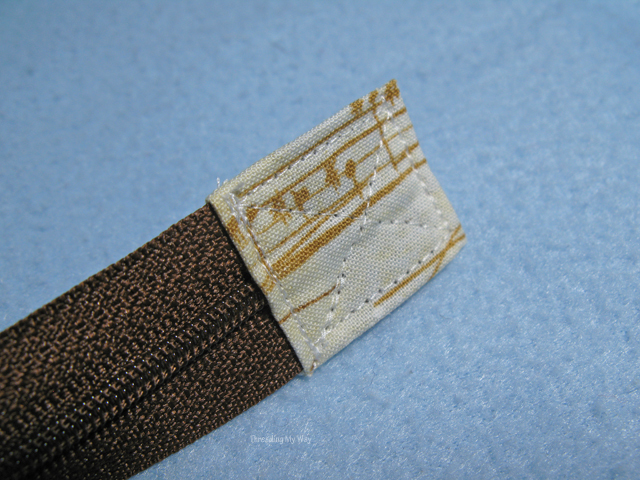 The finish of my zipper tabs has much improved since I began making them. I've modified instructions found online, to suit my style of sewing. Another thing I'll photograph and show you next time. 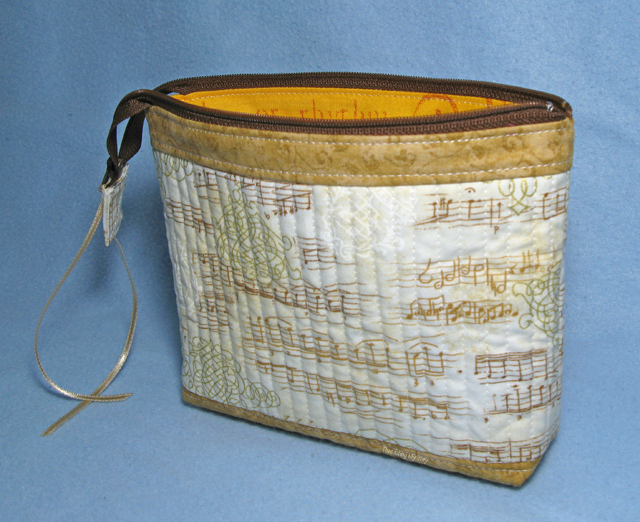 I'll be adding my music purse to Ho, Ho, Ho and On We Sew, on the 18th of this month. I'll also be joining in with Bag It, at Elm Street Quilts. There's some great sponsor prizes for both link ups. I won last month's Lost and Found Christmas fabric by Riley Blake, over at Celtic Thistle Stitches November Ho, Ho, Ho and On We Sew. If you sew something Christmas related, December's link party will open on the 18th. 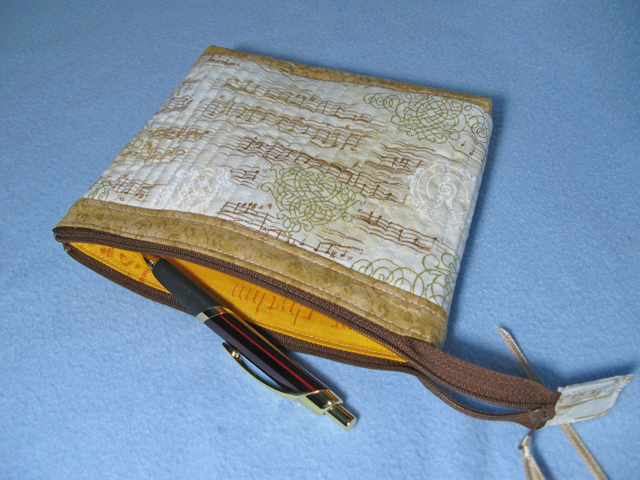 If you make a zippered bag, you have until the 14th of this month to enter Bag It. How are you going with your holiday season planning? I have to say, that for the first time in my life, I'm feeling semi organised. OH there it is - I saw the bag on Pinterest before I saw it on your blog - I didn't realize it was yours until I read the caption - I stopped to look at it because the fabrics are just so luscious! You did a great job on it - I'm looking forward to hearing any tips about making those zipper tabs, as I struggle with that - my fabrics keep shifting. My friend suggested gluing them in place then stitching, and it just now occurred to me that starching the piece might help it stop stretching. Congrats on winning the fabric for Ho Ho Ho - I haven't seen that blog post yet, hehe. I'm not musically inclined either Pam, but my daughter loves to play piano. I am making her a make-up bag and asked her what fabric she wanted and she asked for sheet music fabric with a red lining. I am making this bag with a metal frame though not a zip bag. I love your bag Pam. Thanks, Sheila. I'll write up that tutorial when I've finished my Christmas sewing. Wise move to not add stress to your life. Glad you have recovered well. You are certainly perfecting zippers! With the exchange rate at the time, and including postage, they ended up much cheaper than I could buy here in Australia. 100 zippers has lasted a long time. If I see specials locally, I'll snap them up, too. My stash is running low and I'll need to buy some soon. Zipit will be my first port of call. If they're still cheaper than here in Australia, that's where I'll order. Pam this is such a pretty pouch. I never see any with musical sheets. I take my hat off to you I could never sew a zipper like that. Thanks, Mary. I didn't need to buy much of that gorgeous fabric, but I think I still have enough for one more bag. I'll do a tutorial on zippers when I've finished my Christmas shopping. Beautiful bag, Pam. I love it when such unrelated fabrics seem meant for each other! I'm looking forward to your zipper tab tips as well. I seem to be hit or miss when I make them, it's very frustrating. Have a lovely holiday! Beautifully made, this is a treasure! Lovely fabric combination, hurray for helpful shop assistants. I've not seen music fabric in colourways other than black and white before, so great find all round. Low Volume Fabric ~ What Does It Mean?